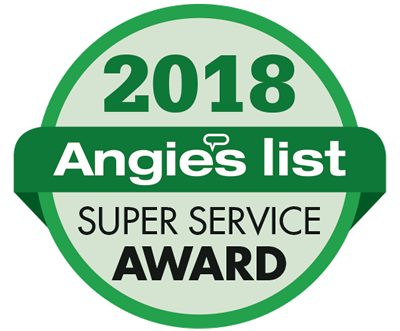 Building sunrooms and 3 & 4-seaon rooms in the Kansas City area since 2001. As your trusted designer and builder of sunrooms and season rooms, Archadeck of Kansas City would like to walk you through the process of planning your ideal outdoor living space. 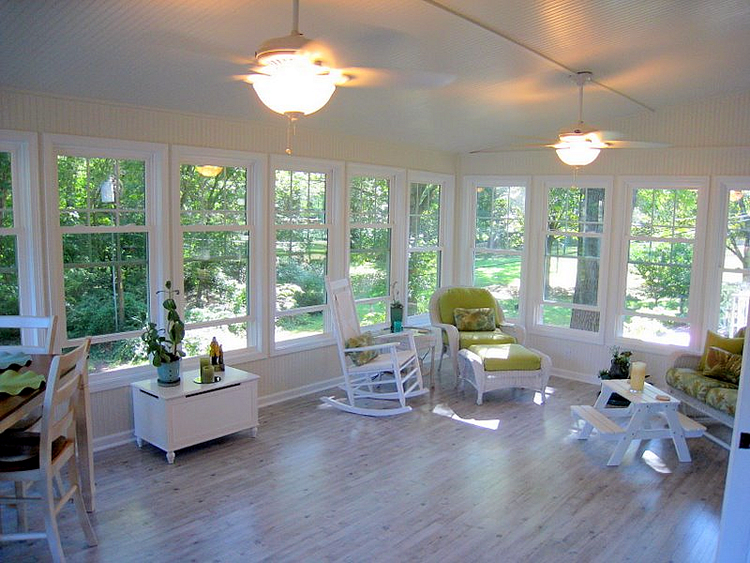 Your choice of a sunroom or season room depends on many factors, but most importantly how you intend to use the space. 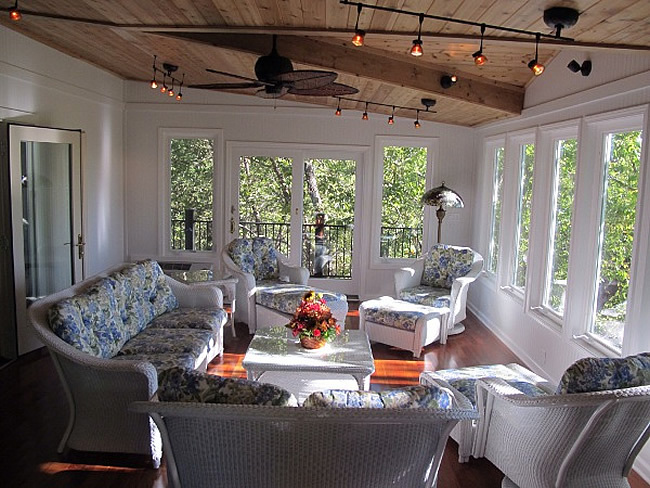 We custom tailor each sunroom to the exact specifications of our clients’ needs. 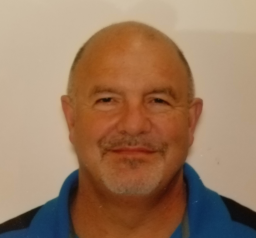 Archadeck of Kansas City will answer all your questions in the planning stages, and pose additional questions to you regarding your planned usage of the space, which will lead us to important design decisions. By “design” we do not mean how your space will be decorated, but rather the size, layout, and materials that will be used to build your space. With in-depth questions, we will arrive at the perfect outdoor living design for your specific needs. Do you want to use your new room year-round, or only in milder months? This very important question will help us decide if you require a 3-season room, or a complete sunroom addition. The difference in the two? With a 3-season room, you will have windows, but no HVAC or insulation, which means if you want to use it in cool weather, you will need a space heater. With a space heater in a 3-season room, you could easily get 9 or 10 months of comfortable usage. With double-paned windows, you can get extended use of your new room, so your choice of windows for a 3-season room play a big role in usability. Let’s face it, in the cool weather months, we long for sunshine to stave off the gloom. What better way to take in the sunlight than in a room that makes you forget that it’s cold outside? Bright spaces, like this one, are sure to help! This clean design with comfortable furnishings and tile floor has the essence of an island getaway. Notice how there are two distinct areas for relaxing and eating. Conversely, if you are planning to use your new room all year long, a sunroom will suit your needs. Sunrooms are actual home additions, with walls of windows that offer sunlight even in cold weather. With a sunroom addition, you will have double-pane windows, complete room insulation, and many times, HVAC. While all of these things are costlier than a 3-season room or even a screened porch, you will be able to relax and entertain in your outdoor living space all year long, in complete comfort! Sunrooms are an obvious choice for year-round usage, and a wise investment for those, who long to have the feeling of being outdoors in cold weather months. Your new room will look original to your home – not like an addition. Once we have planned your new outdoor room, and get into the actual design, our renderings will show you exactly what your room will look like. At Archadeck of Kansas City, the most paramount consideration in adding any new outdoor living space to your home, is that it looks original to your home. 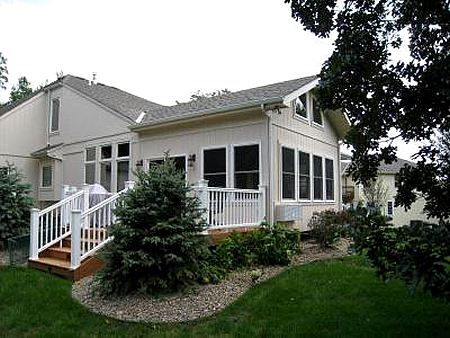 We will meticulously match siding, trim, shingles, and all finish materials to your home! Look how seamlessly the design of these spaces flow from the existing home. 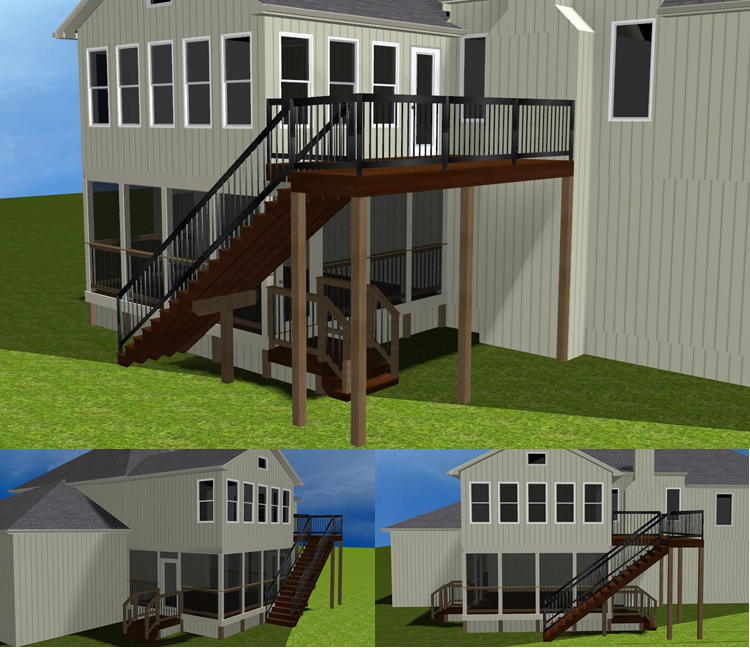 This is a custom second-story sunroom atop a screened porch with accompanying low-maintenance deck and stairs. All new materials are complementary to the home. The dark colors of the deck and railing work in great contrast with the lighter materials used on the home, screened porch, and sunroom. 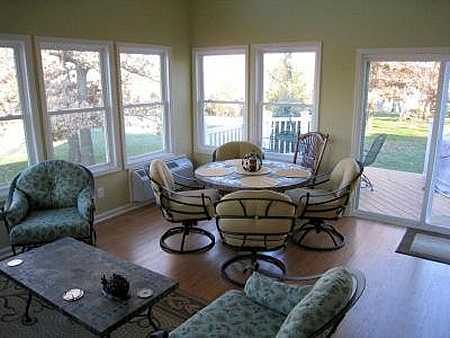 Custom interior finishes are hallmarks of an Archadeck of Kansas City sunroom. Sunrooms, and even 3-season rooms and porches can have many custom touches. Finished ceilings, like the one you see here, conceal electrical wiring for lighting, ceiling fans, surround sound, TVs, and more. Commonly, ceilings are finished with tongue and groove pine or cedar, or unfinished or painted beadboard. The tongue and groove ceiling in this room is not only beautiful, but allowed for installation of eye-catching lighting and a ceiling fan! 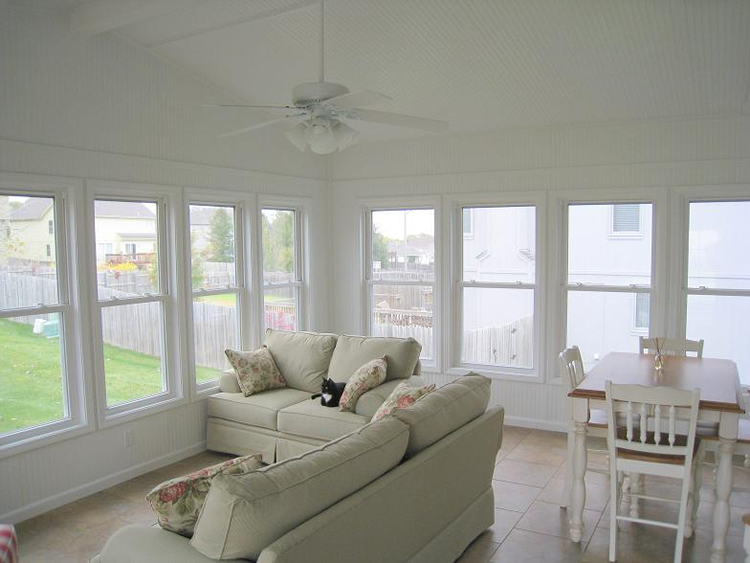 This sunroom will remain comfortable in all seasons! This room is fully insulated and includes an under-window, wall-mounted heating and cooling unit to keep the room cool on warm days, and warm and cozy in the cool weather months. These homeowners chose to add even more sunlight to their sunroom by including skylights in the custom finished tongue and groove ceiling. The rich color of the ceiling is made brighter with the additional light entry into the space. 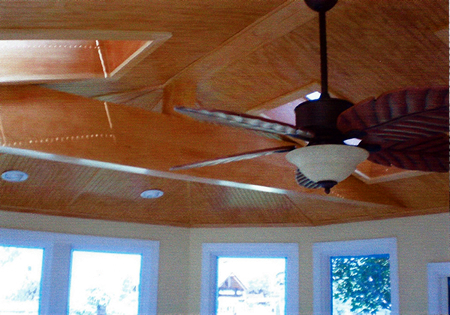 A ceiling fan and recessed lighting were also installed in this beautiful ceiling design! This sunroom looks like a natural extension of this home. We perfectly matched the exterior finishes to the original home, and complemented the existing roof line with a gable roof. This beautiful room addition doesn’t look like an addition at all! 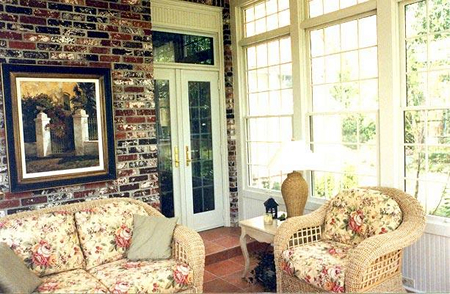 This beautiful sunroom in Leawood, KS, was expertly built around, and to include the home’s exterior masonry. These tall windows are topped with transoms for ultimate sunlight entry into the space. In this case, the existing masonry becomes a stylish interior brick wall. This sunroom addition is truly an extension of this home’s interior spaces. Comfortable furnishings and custom décor tie this new space to the existing spaces inside the home. 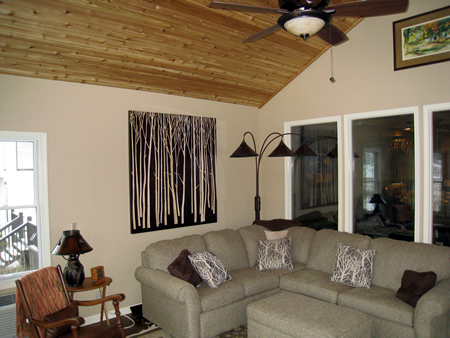 The vaulted cedar tongue and groove ceiling adds a truly custom, rustic design aesthetic. A split heating and cooling unit mounted beneath the window, will keep the space comfortable, no matter the temperature outside!